Take the mystery out of wrinkle shield and other laundry settings so you don’t damage your clothes. There’s nothing worse than pulling out a load of clothes out from the dryer and finding that your favorite jeans or new sweater are shrunken beyond repair. With so many laundry settings and cycles, it can be hard to decide to run an automatic cycle or when to use the timed dry. And that’s just the beginning. Here’s a primer for what those settings mean. 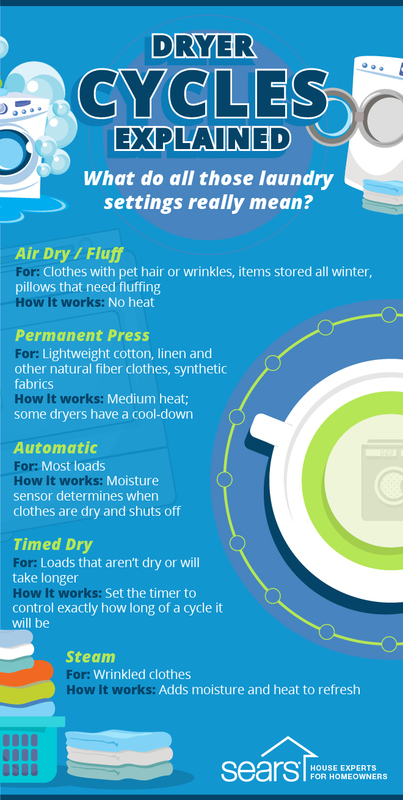 If you’ve ever asked yourself, “What does the air dry cycle do?” or “When should I use the steam cycle?” this infographic is right for you. It’s high time you unlock all of the fancy features of your new dryer — before you shrink all of your favorite clothes.